Gordon Bailey made his stage debut in Birmingham in 1894 and his first London appearance in 1899 at the Prince of Wales’s Theatre as Egeus in A Midsummer Night’s Dream. Over the years he returned to Shakespeare regularly. 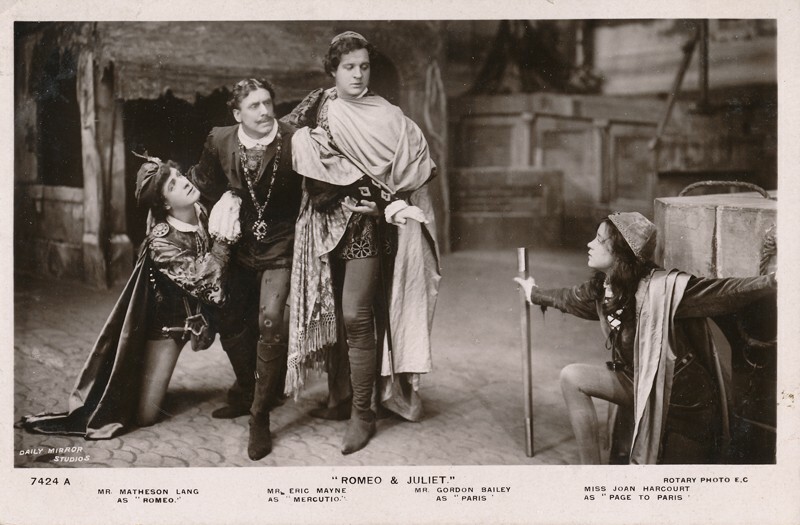 In 1908 he played first Paris, then Mercutio, and finally Romeo in Romeo & Juliet in Matheson Lang‘s production of the play at the Lyceum Theatre, London. In 1909 he played Lear and in 1913 Mercutio again. He played Lennox in Macbeth, but his final association with Shakespeare was his best: he was invited to play at Stratford for the 1927-28 season with the New Shakespeare Company. Bailey was never the “star” nor often the leading man, but he worked steadily, even at one time playing Mercutio in a film version of Romeo & Juliet.